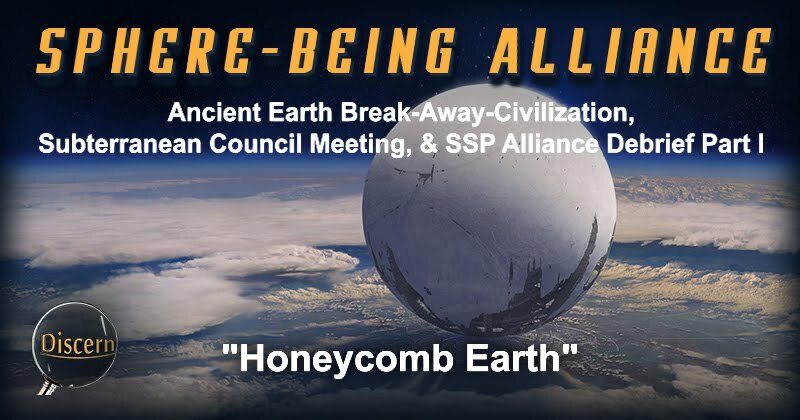 Discerning the Mystery: Sphere-Being Alliance - Ancient Earth Break-Away-Civilization Subterranean Council Meeting & SSP Alliance Debrief Part I - "Honeycomb Earth"
Sphere-Being Alliance - Ancient Earth Break-Away-Civilization Subterranean Council Meeting & SSP Alliance Debrief Part I - "Honeycomb Earth"
Remember: not one person in the Manhattan Project squealed. Not one. Not ever. The penalty for speaking out was terrifying enough to ensure complete compliance. Therefore it is absolutely possible that an even more advanced program could have been generated, on a much larger scale, and still exist to this day -- without any public awareness. I have seen the vast, glittering facilities our money has built with my own eyes -- through the windows and transparent panels of advanced spacecraft. I have landed in those craft and walked in those bases. I have met the people who live and work there. I have seen their faces and spoken to them just like I am speaking to you now. We quickly discovered that our own solar system is literally teeming with intelligent civilizations -- from many different points of origin. Some of them are extremely benevolent, some are extremely negative and others are just visiting, without really picking a side. The beings associated with these spheres were very highly advanced. They do not require technology to travel throughout the universe or accomplish any of their goals. Even to the most advanced ETs in contact with our SSP, these new folks are on an entirely different level – and far more advanced. The SSP believed that the benevolent ETs were bound by a “Prime Directive” that forced them not to interfere. For many years, that was true. As it turns out, the Prime Directive was always intended for our own protection – so these negative groups would never actually be able to completely conquer and overthrow our planet. David Wilcock worked since the mid-1990s to spread the word about the greater reality we live in, and along the way came in contact with many high-level insiders with a surprisingly deep knowledge of these classified subjects. After I began disclosing my knowledge to him, and finding countless connections with what other insiders told him, a wild rollercoaster of unforeseen events led to me coming forward and revealing my true name and identity to the world – at great personal cost. Only a few months after this was done, the beings within these spheres contacted the SSP and asked for me by name. I had not worked for them for many years and this was the most profoundly life-altering event I have ever been through since I was first contacted by the Blue Avians a little over four 4 years prior. Protocol and paperwork was thrown to the side as I was brought back into a world I had only had seldom, brief contact with since the 1980s. Suddenly, I was being asked to speak on behalf of these beings – the Sphere Alliance – as their delegate. This included addressing the SSP as well as a group of over 40 different intelligent civilizations known as the Super-Federation, who have been running 22 different genetic programs on humanity for thousands and thousands of years. Again… I understand that this story seems extremely farfetched. Let me remind you that I had everything to lose – including a six-figure-a-year salary – and nothing to gain by coming forward. The Gaiam TV job does not pay enough to support my family. It has only been through your conscientious donations that I have been able to continue doing this at all. The people in the SSP Alliance had a team member who we are calling Lt. Col. Gonzales, who had been in contact with the Sphere Alliance for about four years – roughly the same length of time as I had been. Gonzales was the SSP’s choice for a delegate. I was an outsider – a has-been who lacked the training and expertise to be brought into such a role. That was their feeling. As a result, I was ridiculed and harassed when I was brought back into their world. Tensions mounted as they continued to look for flaws and see me as unworthy of the role I was given. I suppose it is human nature to look for character defects in others, particularly if they have been given some position of authority – whether they wanted the job or not. In order to fully understand the background of all my experiences, it is necessary to read previous articles on this site and / or to watch the Cosmic Disclosure series. I had found myself in an awkward position in recent weeks after I had some meetings with the SSP Alliance Council that became very heated and personal. They told me, flat out, that they did not want me to be involved in future delegation meetings -- and that Gonzales had proved to be far more adept as a diplomat than I had. Furthermore, I had upset some of the Super Federation members by providing detailed information about some of them at our most recent Gaiam TV recording of Cosmic Disclosure, which hasn’t even aired yet. It was made pretty clear that they were trying to force me out of the position I was in, and have Gonzales take my place. Recently, the Sphere Being Alliance indicated that they would not honor the SSP Alliance Council and the Super Federation Council’s requests that I be replaced. This led to a meeting with explosive tension where I really lost my cool, as did they. There was yelling, aggression and cursing. I am by no means spiritually superior, and this has been as stressful on me as it has on them. We had a couple of meetings after this first explosive one where things settled down, and we exchanged mutual apologies. Ultimately we all want the same thing – to free humanity, and our entire solar system, from the rule of these corrupt secret earth government syndicates, and the highly evil groups that have been controlling them. As a group, the SSP has now been sharing ideas and guidance to help shape my own future, as well as that of humanity as a whole, in a more constructive manner. I am simply the first of many insiders who will be coming forward and revealing the full scope of what has gone on for so long. As I have said before, the NSA held a vast treasure-trove of SSP documents for blackmail purposes. Snowden captured all of this data in his epic hack. The encryption was only very recently broken. Once the public is aware and angry enough to hear the truth, such as in the aftermath of a highly upsetting economic collapse, this documentation will be released in a vast data dump. And it will utterly transform reality as we know it in a matter of days. The AD or “After Disclosure” society will be so radically different that every film, every TV show, every blog, every YouTube video, every book, every article, everything from before the event will be as antique and quaint as a black-and-white silent film with a scratchy, bouncy piano soundtrack. We will realize the awesome scope of deception that worked against us for not hundreds, but literally thousands of years. It will be a time of grief and healing as we are forced to accept the truth of our past, and direct our attention towards co-creating a much bigger and brighter future. In these same meetings, I found out that Gonzales had attended a couple of Super Federation conferences without my knowledge. He had also attended a newly formed council of Ancient Earth Breakaway Civilizations. I was aware that advanced civilizations had come and gone from Earth’s surface in our distant past. They used their own advanced technology to terraform vast pockets inside the earth with all the comforts of home. This provided them with a protective barrier against whatever enemies, both natural and extraterrestrial, threatened them on the surface – including cataclysmic natural disasters. In my time at the SSP, I had access to “smart-glass pads” that were similar to an Ipad, which revealed some of the civilizations living and warring inside the earth. Some of them were more humanlike and familiar, whereas certain others were reptilian. One particularly nasty race was called the Raptors, and had hideous reptilian features as well as a scrawny plume of feathers running down their backs. This Ancient Earth council, by comparison, was comprised of the more humanlike groups. They were aware of some of the other opposing factions, but were not in alliance with them. The humanlike groups decided to sort out their differences with one another out of necessity after a rise in conflicts with various other subterranean groups. I was informed that I would be attending meetings with this Ancient Earth council in the near future. This very much excited and intrigued my curiosity. At the same time, these meetings have brought me face to face with highly negative groups, including the Draco “White Royal”, so I always have a certain sense of dread when facing any new experiences of this type. Not long after I found out I would be meeting this unforeseen new group, I was contacted and given a date and time for when it would happen. I was given no other information about the groups I would meet or what to expect, which I have started to become accustomed to. On the date of the meeting I expected to travel via a blue orb, as I would normally do for any meeting. This is not how SSP people usually travel by any means. It is a portal system used by the Sphere Alliance that seems to involve the use of a living, conscious being – the blue orb – as the facilitator of a nearly instantaneous journey to wherever I need to go. I made sure I was up and out of bed at the proper time, in the middle of the night. I expected to experience the travel procedure that has now become a normal occurrence. Ten minutes passed and nothing had happened. I walked into my living room. I stood in the living room for a few more minutes and nothing happened. There have been times in the past where meetings were scheduled and they just never occurred, and only later would I find out there had been interference or problems that necessitated their delay. I decided that since I was already awake, and the meeting was not going to happen, I would get on the computer and catch up on emails and Facebook posts. I was standing at the foot of my couch when there was a bright flash of light. I felt a strange static electrical sensation for a moment and then noticed I was not in my house any longer. My eyes were a bit blurry, both from it being very early morning and from the unexpected flash of light. I found myself in a very large and perfectly polished granite room that was round, with a domed ceiling. There were two men in beautiful silk robes and silk fabric sandals standing there. They were standing on either side of an arched doorway. There were similar doorways on all four sides of the room with two men standing sentry. Each of the two men looked slightly different in ethnicity and build. Each man was also wearing a large gold pendant with a different symbol on it.